Bordeaux is located near the European Atlantic coast, in the southwest of France. You can come to Bordeaux by train, by plane or by car. The main train station is "Bordeaux Saint-Jean". The Bordeaux airport is located in Mérignac (12km from Bordeaux downtown). The airport provides connection to many French and European cities. Informations about the social event can be found here. The conference will take place on the Bordeaux university campus. The reception desk will be in LaBRI building. You can reach the LaBRI using the line B of the tramway, Peixotto station. From the Saint-Jean train station, the easiest but not the fastest way to get to the university is to take the tramway (green C line) to "Parc des Expositions / Gare de Blanquefort" and stop at "Quinconces". Then change and take (red B line) to "Pessac". The nearest stops from the LaBRI are "Peixotto" and "Béthanie". If you are in a hurry, from the Saint-Jean station, take the bus "Liane 10" to "Gradignan Beausoleil/Village 6" and stop at "Peixotto". To reach the bus stop, cross the main street in front of the railway station. Take the shuttle Jet'Bus to Bordeaux. Get off at the stop "Office de Tourisme" from which you should see the tramway. 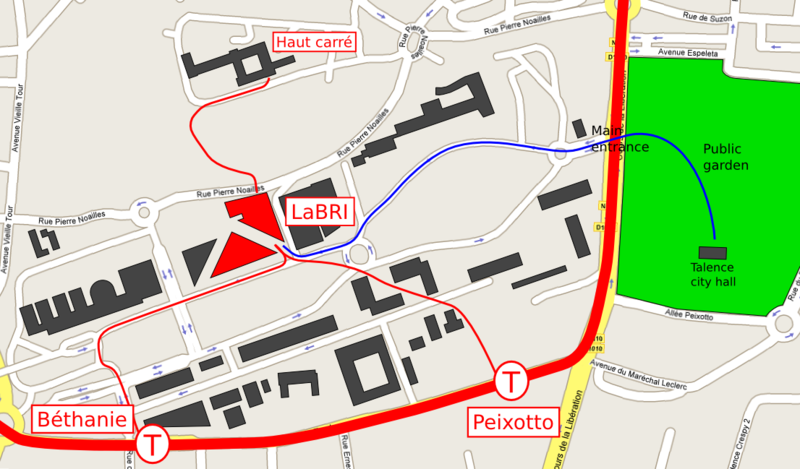 Take the tram B to "Pessac" and stop at "Peixotto" or at "Béthanie" (see the campus map). Another option is to take bus Nr.1 (Liane 1) of TBM at the same place at the airport and get off at the final stop "Quinconces" (which is the same as "Office de Tourisme"). To reach the conference venue from the city center, take the tram (line B in the direction "Pessac"). The nearest stops from the LaBRI are "Peixotto" and "Béthanie". A taxi ride to the LaBRI costs about 10-20 EUR from the railway station and about 20-40 EUR from the airport (depending on the traffic and time of day). Make sure the driver uses the meter. The campus is easily accessible by car. However, within the historic city center of Bordeaux avoid using a car whenever possible (the tram is the fastest option). From the beltway (rocade), use exit 16 "Talence-Domaine Universitaire." Follow the direction of "Bordeaux centre" down the "Cours de la Libération" to the big green gate which is the University main entrance. Find an accommodation in Bordeaux. The SSID eduroam (WiFi) is broadcasted by the LaBRI.